Rob Page has had a taste of taking on Premier League opposition in the EFL Cup this season, and he wants a repeat performance in the FA Cup. And he hopes that his and his players’ ambition will ensure the Cobblers won’t take anything lightly when non-League Harrow Borough come to Sixfields in the first round on Saturday (ko 3pm). Town enjoyed a win over Premier League side West Bromwich Albion and then pushed Manchester United hard before losing 3-1 in the EFL Cup, but the giant-killing boot is very much on the other foot this weekend. On Saturday it is Sky Bet League One high-flyers Northampton who are the Goliath to Harrow’s David, and Page will be doing all he can to ensure Town are not slayed and take the first step to reaching the third round when the big boys of English football enter the fray. “It is pleasing, to be at home against non-League opposition,” said the Cobblers boss. “But we won’t be taking anything for granted and it will be a test. “This is a competition we want to do well in, we want a good cup run. “We showed in the last competition and to get somebody like Manchester United coming to town is not only great for the town, but for the football club and supporters. “We want that again, and it is a great opportunity for myself and the players to go on and play against higher opposition. Ryman League Premier Division side Harrow will come to Sixfields in confident mood, having lost just one of their past 10 games. Page has done his homework on the opposition and went to watch them see off Herne Bay 3-0 in the FA Trophy on Tuesday, and he will be guarding his players against any sort of complacency. “Playing non-League teams is always tough, because it is like a final for them,” said the Town manager. 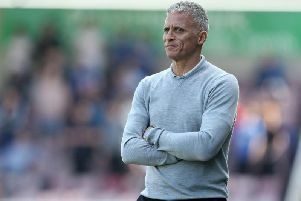 “That’s no disrespect to them, it is just a great opportunity for them to come to Sixfields and play on a great pitch and show what they are capable of. “There will be upsets in this competition, and we have to make sure it is not us on Saturday.